BERLIN (Reuters) - Germany's new eurosceptic party is poised to make strong gains in two regional elections this weekend, ratcheting up pressure on Chancellor Angela Merkel who faces a threat on her right flank for the first time since taking power nine years ago. The small but fast-growing Alternative for Germany (AfD) poached thousands of votes from Merkel's conservative Christian Democrats (CDU) in an election in Saxony two weeks ago, winning nearly 10 percent of the vote there with a focus on law-and-order policies and conservative values. It could repeat the trick in two other eastern states -- Thuringia and Brandenburg -- on Sunday. "Merkel has brought stability to the German economy and that has kept the conservatives in the CDU quiet," said politics professor Nils Diederich at Berlin's Free University. "But if the CDU starts losing votes, Merkel could come under pressure." The threat from the AfD is not immediate. Merkel enjoys record popularity ratings of over 70 percent and is the undisputed leader of her party and government after leading the CDU to its strongest performance since reunification in a federal election last year. But the rise of the AfD has led to grumbling from some of her allies who worry that the CDU is at risk of losing its appeal to traditional conservative voters because of Merkel's shift to the political center. Horst Seehofer, leader of the Bavarian Christian Social Union (CSU), sister party to Merkel's CDU, warned this week against underestimating the AfD, saying they were "no dummies". If the AfD establishes a foothold in the three eastern states and then spreads west, they could become a major headache for the chancellor in the run-up to the 2017 federal election. A recent poll by Emnid showed that 22 percent of Germans could imagine voting for the AfD in 2017. The party narrowly missed the 5 percent threshold for getting into parliament in the federal election one year ago. Recent polls put their national support at around 7 percent. In Thuringia and Brandenburg, the state that surrounds the capital Berlin, the AfD is expected to score up to 9 percent. "The CDU's core message is 'we will save the euro at any price'. 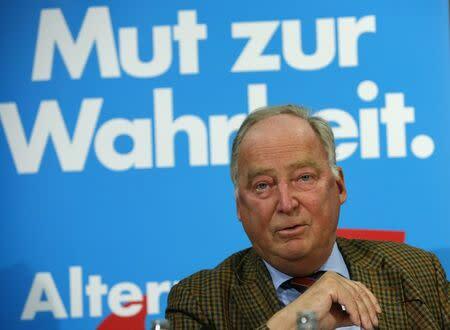 We can't have that," said Alexander Gauland, who is heading the AfD campaign in Brandenburg. The AfD is staunchly opposed to the euro zone bailouts that Merkel has helped engineer and finance. Brandenburg is expected to remain under control of the center-left Social Democrats (SPD), who rule with Merkel in Berlin's "grand coalition". In Thuringia, the hardline Left party, which also opposes the euro zone bailouts, could get its first state premier in Germany by ousting the CDU from power after 24 years. Bodo Ramelow who leads the Left in the state, would need the SPD, and possibly the Greens, as partners. Until now, Merkel has largely ignored the AfD and made clear that her party will not consider entering regional coalitions with them. But this past week she appeared to soften her line somewhat, saying: "I never said we won't talk to them". Diederich of Free University says Merkel cannot afford not to react to the AfD, but noted that a shift back to conservative right-wing policies will be tricky given her coalition with the SPD.